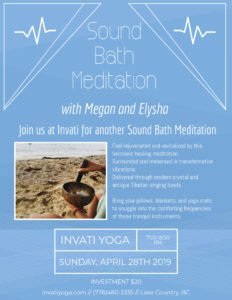 Join Elysha and Megan in a Crystal and Tibetan sound bath/meditation ceremony. Sound meditation is a healing tool that has been used for thousands of years. Sound meditation heals and balances the chakras by what is called entrainment. Entrainment synchronizes brainwaves by providing a stable frequency, leveling out our beta state of consciousness. This in turn heals the body and mind on an internal level. What can sound healing helps with? Anxiety, stress, depression, insomnia PTSD and many other disorders. It is important that when you participate in a sound healing that you drink plenty of water as the the sound vibrations heal the body on a cellular level. Please bring whatever will make you comfortable; comfy clothes, mat, blanket and pillows.